This book provides a synchronic description of the phonology, word classes, morphology, and syntax of the Cheke Holo language. Cheke Holo is an Austronesian language of the Oceanic subgroup, spoken by 11,000 speakers on Santa Isabel island in the Solomon Islands. This is the first published grammar of Cheke Holo. It is based on the author’s 30 years of linguistic work carried out among Cheke Holo speakers. Like many other Oceanic languages, Cheke Holo has SVO word order, serial verbs, distinguishes alienable and inalianable possession of nouns, and reduplicates verbs to intensify or prolong the action they denote. Four types of demonstratives are attested in Cheke Holo. Basic distinctions of the demonstratives occur between specificity and number, and whether or not the noun modified is proximal or distal. The two-way distinction of past and non-past is the most useful descriptor for the Cheke Holo tense system. Several features of Cheke Holo phonology and grammar are less typical for an Oceanic language. These include its consonant clusters, the voiceless continuants, the verb nominalizations in four different phonemic environments, and the gender distinction in the third person singular pronouns. 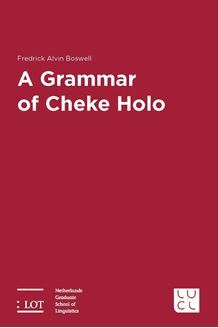 Cheke Holo has a broad inventory of adjectives, and these are often inflected for aspect and possession, and derived into causative verbs. This book also provides information on the encoding of pragmatic emphasis as this is a common feature of Cheke Holo grammar.